Daniel Lewis is a web developer by trade, but his true passion is cooking. So it didn’t take much for his friends, who Lewis regularly treated to his specialty pizzas cooked in a ceramic stove, to convince him to go pro. Originally, Daniel and Audra Lewis’ business plan involved opening a restaurant in Washington state. But when their two investment partners bailed, Daniel Lewis was left with only a dream – and enough to purchase a mobile wood-burning pizza stove. So, he set out to do what “only a handful of people in the country are doing,” he said, which meant hiring a Boulder mason to build a pizza oven able to bake about five 12-inch pizzas at a time. He ordered the shell from Italy and mounted it on a 4,000-pound ornate black trailer, which he hauls with his Jeep Wrangler. When he introduced his mobile business, The Flatbread Pizza Co., to the Spokane area in 2008, it “took off by leaps and bounds,” he said. He cooked at political parties, birthdays, weddings and other private events. This summer, he moved with his wife and two children to the Wellington neighborhood in Breckenridge because of “friends, lifestyle and a community feel,” he said. A few weeks ago, he sold his 9-inch pies at Breckenridge’s Oktoberfest, which he said was successful. “I got the same kind of feedback: ‘This is really good – where’s your place? '” he said. Though he plans on opening a restaurant in Breckenridge that would serve his thin artisan crust pizzas, the soonest that would happen would be this spring. And even then, he’ll continue baking his mobile pies for corporate events, fundraisers, family celebrations and more. Right now, he uses Cool River’s kitchen to prepare his handmade dough and comply with food-service regulations. At 700 to 1,000 degrees, his mobile 53-inch hearth can accommodate about 200 people, with each pizza taking three to four minutes to bake. Though his rig draws attention, what really sets him apart is the taste – and look – of his pizza. He strives for perfection by using only fresh ingredients, but when it comes to forming the pies, he doesn’t aim for circular perfection, which he finds too commercial. Rather, his pizzas come out of the oven in all shapes of oval. “I just like that it’s not all so perfect (because other pizzas’) shape and the way it looks – everything’s so commercial,” he said. His sweet, yet spicy, sauce complements his handmade dough, sometimes flavored with various herbs or hard cheese. He uses simple ingredients so his pizzas aren’t oily or high in fat content. He fuels his Italian wood-fired pizza oven with maple and apple wood, purchased directly from Colorado sources. His pies are inspired by Italy’s Neapolitan style, with its freeform, charred underbelly and chewy interior crust. 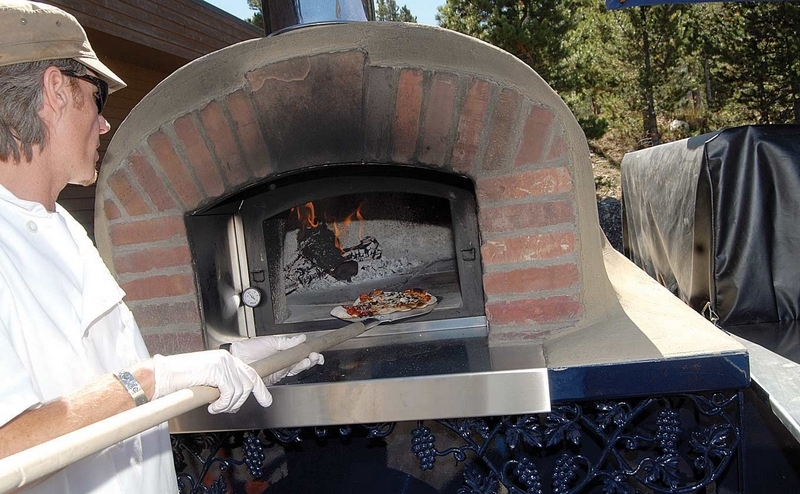 After plenty of experimentation, he’s hooked on wood-fired pizza ovens.